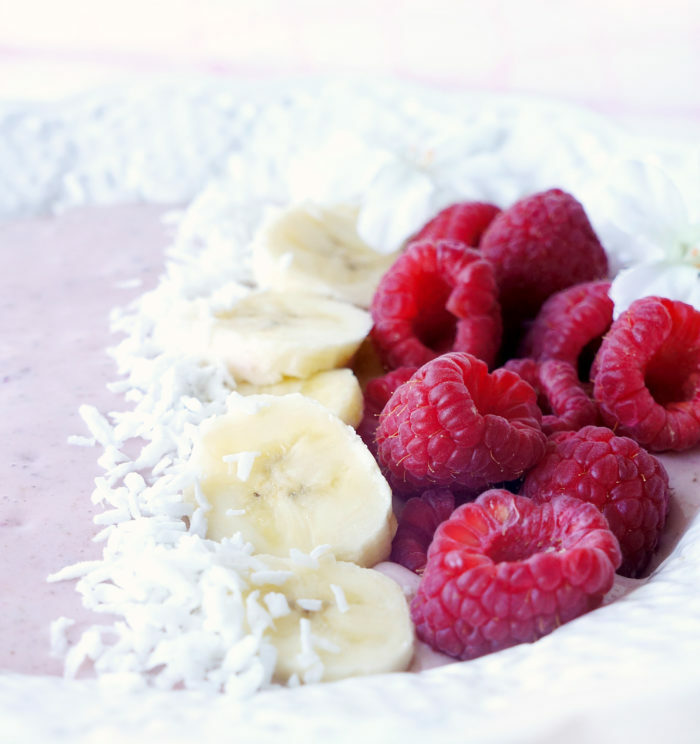 This raspberry banana protein smoothie bowl is packed full of protein and fibre and makes the perfect balanced breakfast or snack to fuel up pre or post-workout! Gluten-free, vegan, and paleo. The other day, my husband Matt mentioned to me that lately he’s been running out of snack ideas to bring to work for after his workout. He generally likes to go to the gym right before work, but the big dilemma is he doesn’t know what to eat post workout since lunch is still hours away. I would konk out on the gym floor if I didn’t have a snack after my work out! A post workout snack is a must, especially one that combines carbohydrates and protein. These components are especially important because the carbohydrates can help to restore those energy storage units, and the protein can help to rebuild that muscle. At the end of the day, both are going to help us progress closer to our goals. That’s what I call a winning combination! I recently found out that Matt really loves smoothies and used to make them all the time, but for whatever reason, hasn’t been drinking them since I moved in. Anyyyways, based on these new found facts, I suggested he fuel up with a smoothie. But this is not just any smoothie. 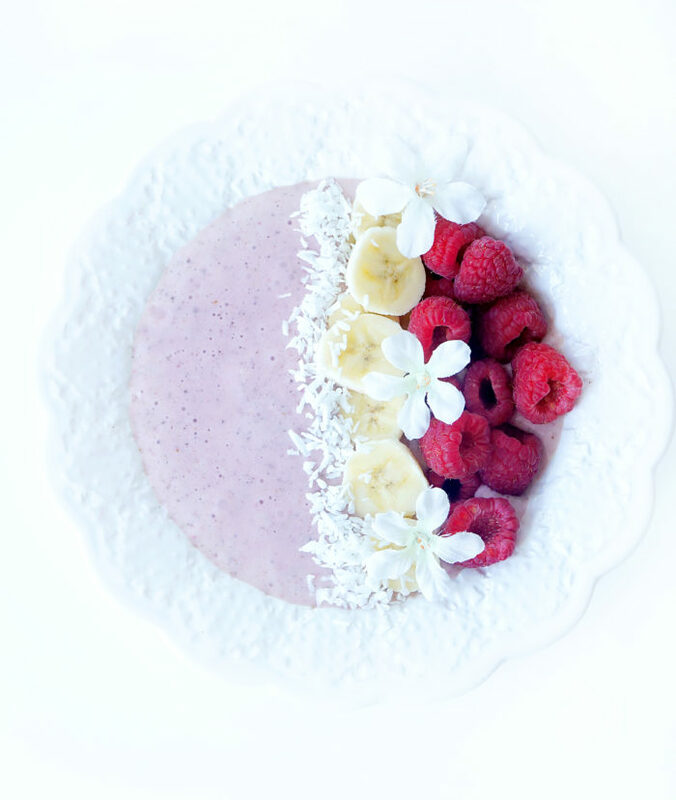 This is a super satisfying, protein and nutrient-rich smoothie bowl. 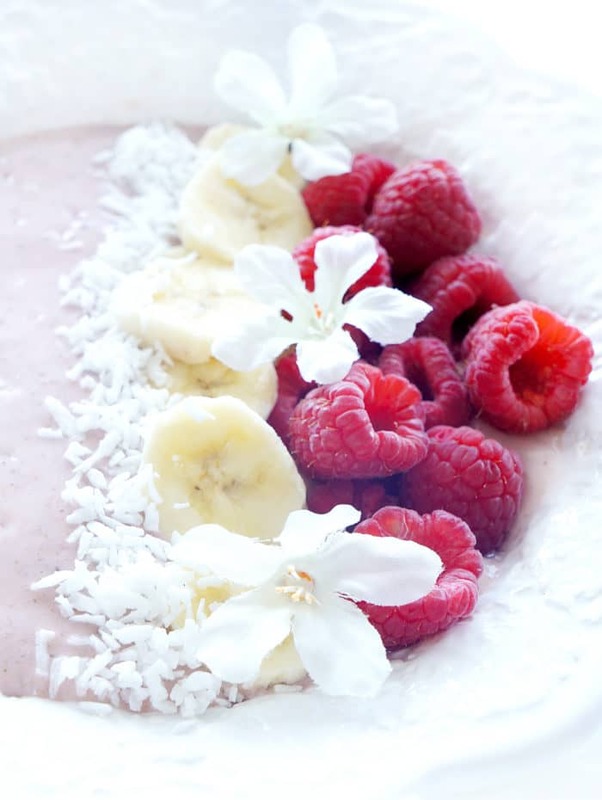 What I love about smoothie bowls is they’re more filling and satisfying than your average smoothie because you can top it up with a bunch of delicious toppings and eat it with a spoon! 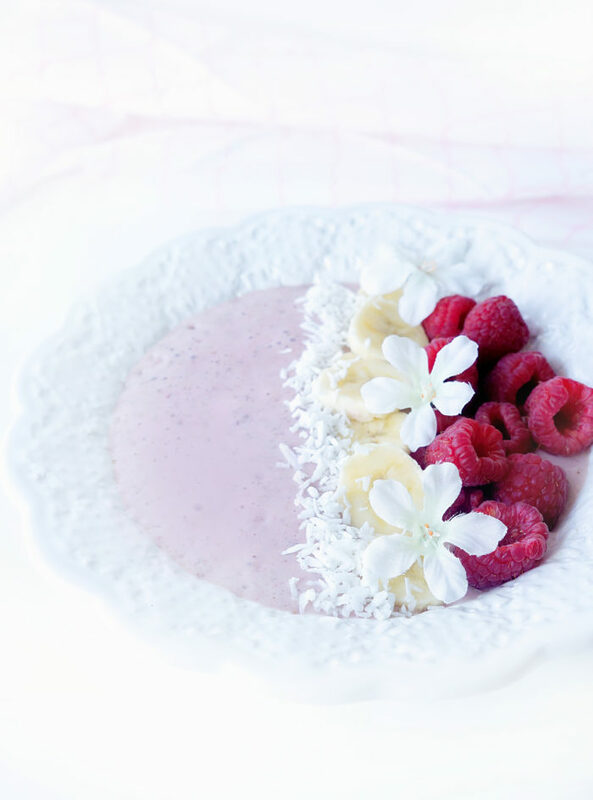 Now I also happen to know that his favourite fruits are bananas and raspberries, so I paired them up to form this bowl of goodness! I added in a scoop of protein powder to increase the protein content which is essential post workout to rebuild that muscle. You can use any type of protein powder, but I suggest going with vanilla flavour to compliment the other ingredients in the smoothie. Some of my favourite protein powders, which also happen to be vegan options are the Sunwarrior Vanilla Protein Powder and Genuine Health Fermented Vegan Protein Powder. A quick and easy snack idea that’s full of fibre, protein, omega-3s, vitamin C and potassium. If all of those nutrients won’t fuel you up, I don’t know what will! When I made up a batch, I kept half of the smoothie in a jar in the fridge and hours later, it was still good to go! 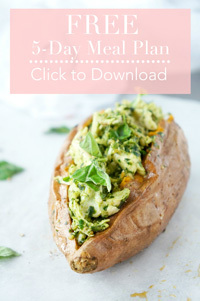 I suggest whipping up a batch and keeping it in the fridge so that you have a ready-made grab-and-go snack! Just top up with desired toppings and take it to go! Add all of the ingredients to a blender and pulse until smooth and creamy. Pour into a bowl or jar and top with desired toppings. Enjoy!